Browse our courses below and take action! Get started in building strong foundations in your professional English education career with Spalding Education Australia. The MILA 1 is our most comprehensive Spalding course to equip you with all the skills you need to become an exceptional English teacher. There is also a highly recommended MILA 1 Refresher course if you’ve studied with us before. Phonological Awareness and Phonogram and Rule Introduction/Parent courses are an excellent place to start if you’re a beginner wanting to explore the world of English education. Looking to advance your skills and take your knowledge to the next level? 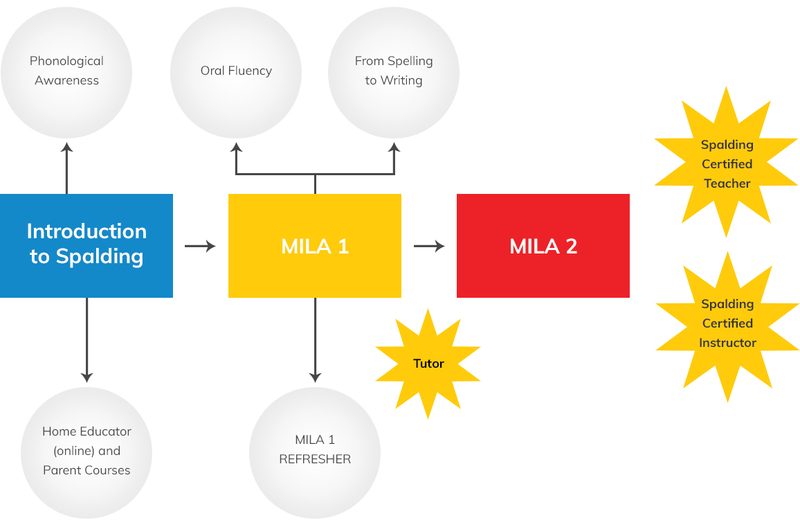 Our Oral Fluency, From Spelling to Writing, and MILA 2 are great next steps for your career. If you’re not sure if Spalding’s right for you, please visit our Introduction to Spalding options. Click on the appropriate tab to learn more about each course. There are many imitators, but Spalding Education Australia is the only authorised source in Australia that perpetuates the Writing Road to Reading (WRTR) and The Spalding Method (TSM). We’re committed to providing our students with quality courses and support to nurture a confident English instructor. Our highly sought after certifications will distinguish you as an education professional and accelerate your teaching career. As a student of Spalding Education Australia, you’ll undergo a variety of challenging, yet rewarding tasks to build your confidence in the classroom. Our courses are unrivalled - backed by evidence-based research and proven to yield positive results in improving the English language skill level. Our courses provide the essential tools to teach reading, writing, and spelling. After successfully completing MILA 1, you will have the confidence and skills to tutor children and adults using The Spalding Method. You may now register as a Tutor on our website. As a Spalding Authorised Tutor you will be equipped with the tools to confidently implement The Spalding Method at home, school, or in another setting amongst individuals, or small groups struggling to improve their spelling, reading, or writing. A Bachelor’s degree from an accredited college or university is required to qualify as an SCT along with the completion of MILA 1 and MILA 2 twice and submit 5 videos that demonstrate your teaching method of each aspect of the Spalding lesson to be reviewed by our accreditation panel. SCTs are certified to implement The Spalding Method in an educational setting (public or private schools, reading or literacy centres, clinics etc…). SCTs are also qualified to demonstrate and explain The Spalding Method to parents and teachers in group “question and answer” sessions and teach the Parent Introduction to Spalding course. The top candidates amongst the SCTs are invited to continue their studies to become a Spalding Certified Instructor and will need to submit at least 2 more videos of your teaching practicums for review by our accreditation panel. Spalding Certified Instructors are highly respected positions. SCIs are the only qualified instructors to teach our courses to educational professionals and those wanting to gain a deeper understanding of The Spalding Method. If you are interested in becoming an instructor, please contact us or view details of the courses below. LEARN MORE - Download our brochure with information about the cost, assessment criteria, and learning outcomes. This course will take place over the Term 1 holidays and will run for 9 days; Monday to Friday Week 1 and Monday to Thursday Week 2 from 8am-1pm. This course will take place during the July school holidays, and will run from Monday to Friday 8am-1pm. We run regular information sessions about our courses as an excellent introduction to what we do. Our information sessions are in-depth and are recommended if you’re interested in starting your career in education. We can tailor material of our Spalding programs spanning from an hour to a couple of days, depending on what information you’re after. This does not substitute a MILA 1 class but is an invaluable introduction nonetheless. Our information sessions are able to come to you. We will visit your school to discuss Spalding methodologies and deliver sessions to your teaching staff. Get in touch with us today to partner together. Book now online or contact us to express your interest. The MILA 1 Refresher gives the participants the opportunity to return to the MILA 1 course with more experience under their belt to better understand the methodologies, stay up-to-date with industry research, and refine teaching techniques. The course gives students the chance to ask the instructor questions and observe teaching procedures in more detail. The revisions and ideas presented in the refresher will make implementation of the program seamless in the classroom with tips and suggestions for classroom management. Participants will gain greater knowledge of the Teacher’s Guide and its use in planning a differentiated curriculum to meet the needs of all students. Note: You must have completed MILA 1 to be eligible for this course. Fill in the form below or contact us to register your interest. This course will be held on Monday and Tuesday from 9am to 3pm. This course will be held over a weekend from 9am to 3pm. This course will be held over the weekend from 9am to 3pm. This course guides participants through the words for the Ayres list and instructs its use as a basis for sequential, systematic writing instruction. Teachers will be given direct instruction in the teaching of writing. Writing is a difficult skill to teach, and intimidating. This course is dedicated to giving teachers the confidence and tools to help their students succeed in learning writing skills. To be eligible for the From Spelling to Writing course, you must have completed MILA 1 and have implemented the program for a minimum of 12 months. This course is geared for those who feel uneasy about their grammar knowledge and are unsure how to teach or improve their students’ writing skills. This may include general and specialist teachers, administrators, curriculum specialists, speech and reading specialists, instructional assistants and tutors, educational psychologists, and occupational therapists. Contact us today to express interest in From Spelling to Writing! This course will run from 9am to 4pm. Phonological Awareness is the skill set of detecting patterns and manipulating units of sound in oral language- parts such as words, syllables, onsets, and rhymes. Under the umbrella of phonological awareness is phonemic awareness. This is the ability to hear, identify, and manipulate phonemes (the smallest unit of sound) that can differentiate a word’s meaning. It’s critical to the success of language literacy and spelling. Evidence shows that those who struggle with reading also have problems with phonemic awareness. The two terms are often confused, even in academic literature, so it’s not surprising that some teachers have trouble differentiating the two. In this course, participants will learn the differences and the interrelationship between the two aspects and explore the varying levels of phonological awareness. In understanding these relationships, teachers can develop a range of teaching strategies and coaching techniques to help students acquire these skills and build a strong foundation for their literacy journey. Research indicates that the ability to read connected text fluently is one of the essential requirements for successful reading comprehension. The purpose of this course is to introduce participants to the new Oral Fluency Program. You must have completed MILA 1 and have been implementing the program for 12 months to be eligible. Participants need to be confident in their ability to teach the spelling lesson, and their students should have mastered the 70 phonograms and the majority of the 32 spelling rules. Being able to process phonologically, use orthographic skills (decoding), have some semantic skills (vocabulary), and contextual skills (background knowledge) are prerequisites for building fluency in a language. Your students will be equipped to learn a new literacy skill that builds on their existing knowledge with the implementation of the Oral Reading Fluency techniques. Fluency is reading words with ease, expression, and without hesitation. Appropriate volume, pacing, and inflexion are involved. It’s the ability to gain deep meaning of the content read without noticeable mental effort. Participants will learn how to teach students the ability to develop control over surface-level text processing so that their students focus on understanding the deeper levels of meaning embedded in the text. The goal is to have students reach the level of fluency where no conscious effort or attention is required because the fundamental literacy skills have become automatic. Fluency is not an end in itself, but a critical pathway to comprehension. Upon completing the course, you will have all the necessary tools to teach oral fluency to students from Kinder through to adult-level reading and be able to assess and evaluate the oral fluency levels of the students. You’ll be provided with fluency training powerpoints at both primary and intermediate levels to use with the students to equip them in self-directed use of the program. You will be provided with a manual of passages from levels Prep to Year 6. Passages will include both assessment and ongoing practice passages to further develop fluency. Contact us to today express interest in Oral Reading Fluency. The Phonogram and Rule Introduction - US version Course is a 10-hour online program that is designed for parents and invested individuals whose children or students are learning literacy using The Spalding Method. The course includes a brief introduction to philosophy, methodology, and fundamental skills to understand the Spalding Approach. This is a self-directed course, as there is no instructor. You will not be provided feedback, on-going support, or direct instruction by one of our Certified Spalding Instructors. It is a basic course to build on the foundation of understanding of the Spalding Approach for your home. This course is ideal for those who have not previously undertaken a course and are provided with an introduction and overview of a complex literacy approach. It may also serve as a foundation for those learning how to support and enhance the literacy education of children and students. Contact us today for more details on our Phonogram and Rule Introduction course! Similar to the Phonogram and Rule Introduction Course, the Parent Course is a 10-hour program that will deliver a brief introduction to the philosophy, methodology, and fundamental skills to grasp an understanding of the Spalding approach. Rather than a self-directed instruction, like the Home Educator’s Course, the Parent Course is a program organised by schools who are implementing The Spalding Method in their classrooms. It is highly recommended for parents to attend this course if they wish to support their children’s learning at home. The key difference between the Parent Course and The Phonogram and Rule Introduction Course is that this course is support-driven with the guidance of an instructor. Parents can expect this course to be interactive, to be provided with feedback, and can bring questions to the instructor. Additionally, no assessment is required as it is an introductory course. Contact us today to express interest in our Parent Course! We'd love to tell you more! Complete this form and we will get back to you. Please note this is an expression of interest only.